Plywood - layers of plies, glued together. Very strong. 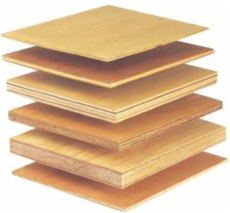 Softwood ply tends to be used in the construction industry for walls, roofs and floors. Hardwood ply tends to be used for quality laminate flooring, kitchen units and some furniture. Marine plywood is used in boat hull construction. It is specially treated so that it is water resistant . GRP (Glass Reinforced Plastic) - composed of strands of glass. Each individual glass fibre is very fine, and they are woven to form a flexible fabric. Fabric is placed in a mould, for instance a mould for a canoe and polyester resin is added, followed by a catalyst (to speed up the reaction). The process is repeated so that there are many layers of fibre glass and resin and allowed to dry/cure. Strong and light. Can be sanded for a smooth finish and painted. Explain the reasons why different materials are combined. Give specific examples in your answer.